Off the east coast of New Zealand, cold rivers of water that have branched off from the Antarctic Circumpolar Current flow north past the South Island and converge with warmer waters flowing south past the North Island. The surface waters of this meeting place are New Zealand's most biologically productive. 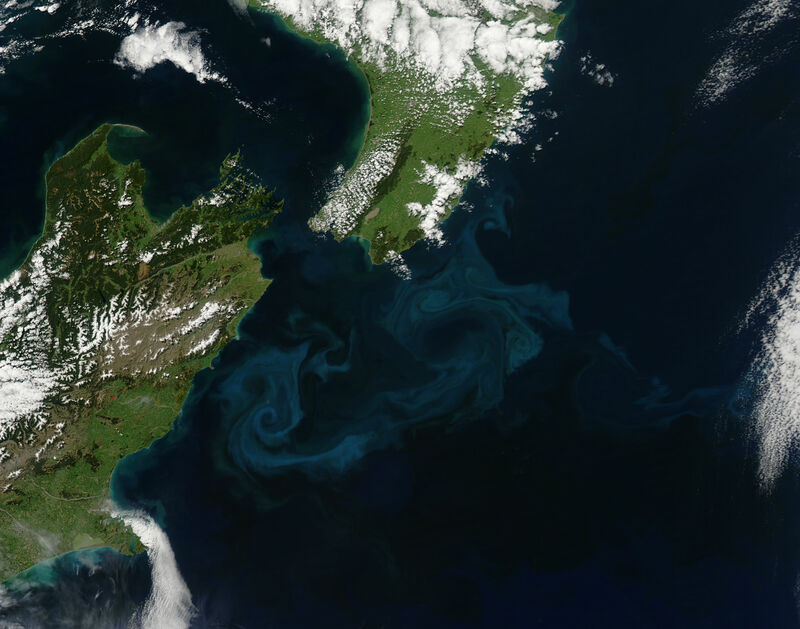 This image of the area on October 25, 2009, from the MODIS sensor on NASA’s Aqua satellite shows the basis for that productivity: large blooms of plantlike organisms called phytoplankton. Especially bright blue areas may indicate the presence of phytoplankton called coccolithophores, which are coated with calcium-carbonate (chalk) scales that are very reflective. The duller greenish-brown areas of the bloom may be diatoms, which have a silica-based covering. In addition to their importance as the foundation of the ocean food web, phytoplankton play a key role in the climate because, like plants on land, they absorb carbon dioxide from the atmosphere. When they die, they sink to the ocean floor where the carbon they took from the atmosphere is stored for thousands of years. NASA image by Jeff Schmaltz, MODIS Rapid Response Team. Caption by Rebecca Lindsey, NASA Earth Observatory. 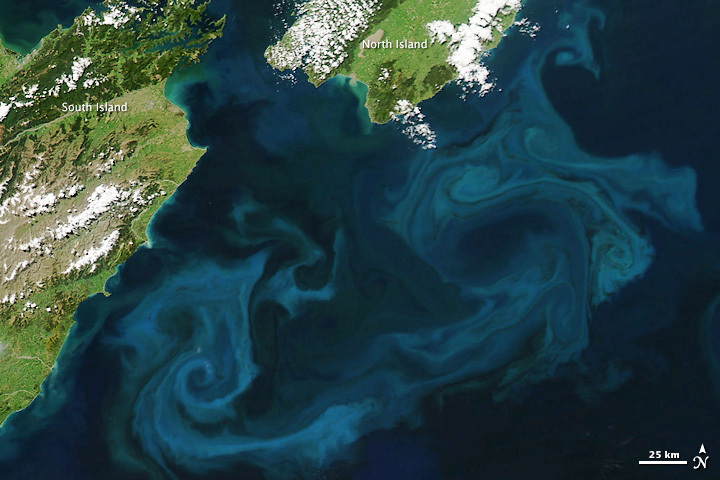 A phytoplankton bloom colored the waters east of New Zealand on October 25, 2009.